Our website builder is designed to meet today's demands - a simple and intuitive way to build an exceptionally visual site. Content elements, such as text, pictures, videos, and slideshows are easily added through a simple, drag & drop interface. A website is as good as its hosting. Clients' websites live in multiple data center locations to offer superior up-time, response time, and reliability compared to most any other hosting option. Upload audio or video files to our multimedia elements and we'll automatically convert them for playback directly from your website. This means that website visitors won't have to download the files and open a separate media player to watch or listen. Our drag & drop form builder makes it simple to gather comments, contact info, and responses from website visitors. We have contact forms, RSVP forms, and surveys already pre-built. We even have a file drop box element that accepts documents, pictures, or other file uploads from visitors. Our form builder is flexible too. Customize forms by dragging and dropping on new fields (such as text boxes, drop-down menus, and check boxes) into any configuration you need. When a form entry is submitted by a website visitor, the entry is stored in the site’s dashboard and can be forwarded to an email address. It’s easy to show off photos in beautiful, professional photo galleries and slideshows. You select the photos to include and we’ll make them look great with transition effects, automatic resizing, and a wide selection of different display styles. Adding a blog to a website takes a single click. Posts are created using the same drag & drop interface. It’s a breeze to include beautiful photo galleries, videos, audio clips, and other widgets in posts. With the fast growing number of people browsing the web with their mobile phones, it’s crucial to have a mobile friendly and accessible website. 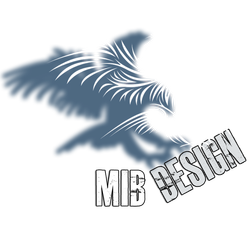 With MIBDesign, we create a mobile optimized version of your website automatically! The visitors that arrive to your website on a phone are shown the mobile version of your site, while visitors arriving to your website on a computer are shown the full website. You don’t have to do anything – it just works! The site traffic dashboard gives you and your clients insight into how many people visited a website, which pages they visited, what search terms they used to find the site, and which websites referred traffic to the site. Your website statistics are calculated in real-time so you can keep a close eye on your data and traffic patterns.